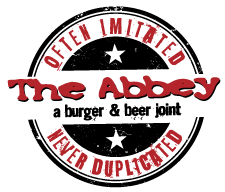 Over the years we’ve developed a cracker-jack team of food and beer enthusiasts here at The Abbey. So for this menu we asked them to mate a beer from one of our 92 choices to our menu items. The criteria was simple yet genius in its design. To make the list, the beer would be judged using just 3 criteria; contrast, compliment or cleanse. We won’t bore you with some kitchy discourse of how each was devised, or go into how many hours and calories were consumed in its pursuit. Just realize we ate and drank alot, and we think we came up with some awesome pairings here. Now sit back and enjoy the results of when “foodies” and “beeries” come together and mate two of life’s little treasures. Great Beer & Great Food. Enjoy! • Lightly salted with a crock of onion dip! $7. or go crazy & add a meat choice. Fresh-cut chicken fingers tossed in Buffalo or Teriyaki sauce. $13. Home-made French fries, chipotle ketchup. $6. Hot & crisp beer infused bread boule filled to the brim with our homemade cheesy Buffalo chicken dip. Served with fresh tortilla chips. $12.50. TATER TOTS º YOUR WAY! Buffalo style with grilled chicken & blue cheese crumbles. $13.50. Add: Cajun or Grilled Chicken $4.50. Dressings: Italian, Balsamic, White Zinfandel, Ranch, Oriental, Blue Cheese, Honey Mustard, or Thousand Island. Crock $7. Bread Bowl $8. White chowder, clams, oyster crackers, dill seasonings. Tender pulled pork rib meat, BBQ sauce, fresh-baked hoagie roll! $11. Grilled flatbread, house-marinated steak tips, cheddar cheese, diced red onion, tomatoes, shredded lettuce, cucumbers, ranch dressing. $13. Lean corned beef, sauerkraut, melted Swiss cheese, fresh marble rye, homemade Russian Dressing. Substitute fresh sliced turkey breast & coleslaw on whole wheat. $11. Marinated & grilled chicken breast, bacon, Swiss cheese, lettuce, honey mustard dressing, choice of bread. $13.50. Blackened chicken breast, cheddar cheese, lettuce, tomato, Cajun mayonnaise, choice of bread. $13. Meatloaf, Wisconsin American cheese & housemade ketchup, bulkie roll. $11. Fresh tacos, white fish, cole slaw, salsa, teriyaki glaze & sesame seeds. $13. Fresh sliced turkey breast, bacon, lettuce, tomato, mayo. $11. Fried Cajun white fish, lettuce, tomato & Cajun mayo, topped with tangy red citrus cabbage slaw. $13. House breaded & deep fried chicken, fried onion strings, cheddar cheese, Jack glaze, lettuce, tomato, & garlic mayo on a French loaf. Sides available for all Sandwiches and Burgers. Traditional flatbread with marinara, shredded mozzarella, Buffalo mozzarella, tomatoes & finished with fresh basil & shredded parmesan. $13. Traditional flatbread with our smokey BBQ sauce, feathered cheddar Jack cheese, BBQ grilled chicken & finished with sliced green Spanish olives. $12.50. All our Entrees include your choice of two sides. Fresh fish, coleslaw, our famous French fries. $14. Traditional style, parmesan cream sauce with broccoli, or spice it up! Grade A veal chuck, pork loin, Black Angus ground chuck, & onion mixed our way with house made ketchup. Served with choice of two sides. $14.